This week I am looking at my mother's side of the family and the Linford surname. At one point we thought the name was dying out in our branch of the family so I double barrelled my maiden name to include it and then gave my children it as and extra middle name. This century there have been 3 Linford boys born to the family so hopefully it will continue for some time yet. The name means dweller at the lime tree ford and there at least five parts of the UK it could have come from. This means we could have originated from Buckinghamshire, Essex, Hertfordshire or Leicestershire. As yet we haven't traced back far enough to find out which. My grandfather Vivian Haldane Bruce Linford was born in Kilmalcolm, Renfrewshire in 1900. 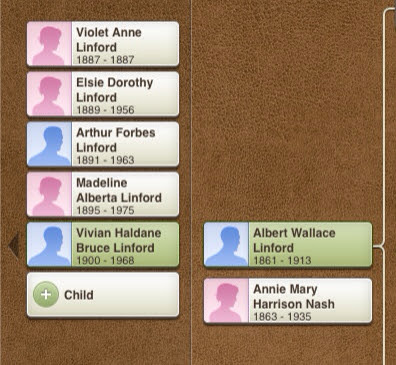 He was the youngest of 5 children born to Albert Wallace and Annie Mary Harrison Nash. 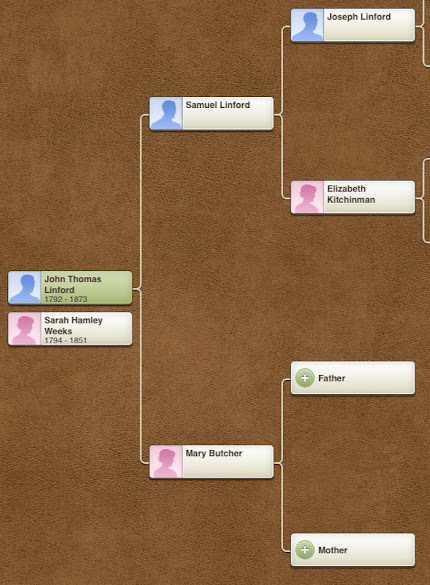 My family seem to have the habit of using surnames as middle names and the Scottish tradition of using other family members names as well. Tragically the eldest daughter Violet died as an infant. 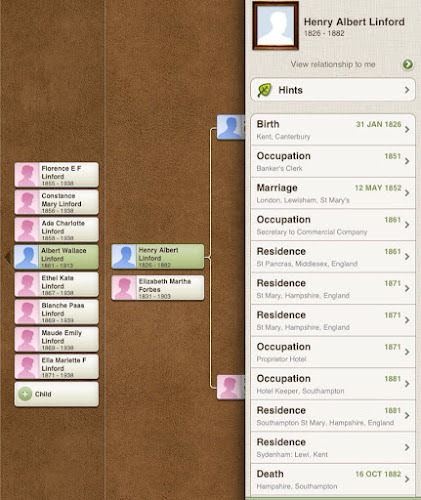 The others went on to either marriage and family or in the case of my great aunt Madeline a groundbreaking career as a journalist and first editor of the Guardian's women's page. There are some interesting articles on her here and on my cousin Paul Linford's blog. She also published a few novels and a biography of Mary Wollstonecraft. Albert was a travelling salesman for a brewery and he had moved from Southampton to Scotland and then down to Manchester as he was posted to different regions. 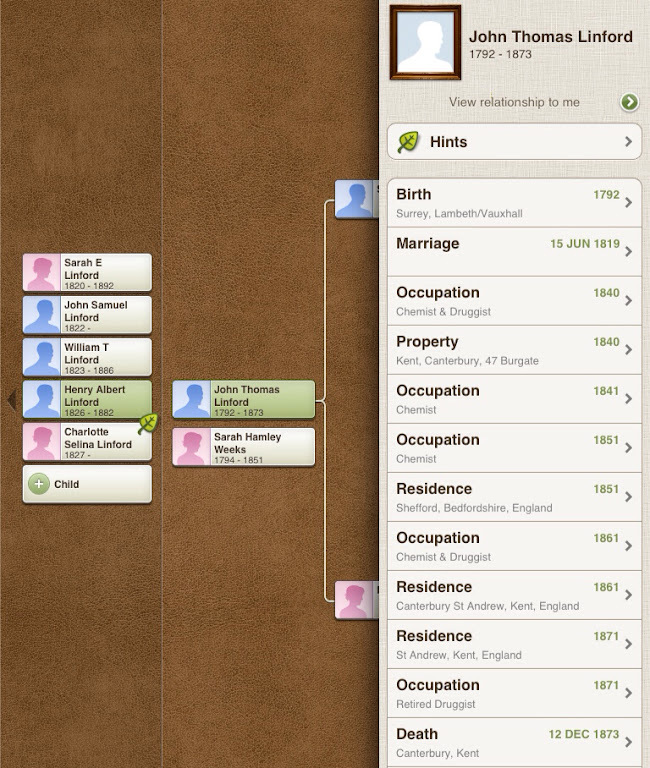 The family were very well off until he was admitted to an asylum around 1910. The former family home in Manchester is now a seminary for Catholic priests and was a substantial family home. Unfortunately medical fees used up most of his estate and my grandfather was unable to follow his siblings to university. I haven't established how Henry went from being a clerk to running a hotel but it seems a strange career move! The hotel was built at the railway terminus from London and it was used to accommodate passengers before they embarked on a liner from the port (later on many first class passengers from the Titanic spent their last night in England at the hotel). Henry was a prominent local citizen and even spent time as mayor. Tragically he was only 56 when he died leaving his wife with children still of school age to raise alone. John Thomas was a chemist and druggist in the city and at one point owned a shop in Burgate. His father-in-law William Weeks had been in the same business and for some years they were in business together. Things weren't always a smooth ride as John appears in bankruptcy records a couple of times. Like his son Henry he held public office and was a mayor of Canterbury in 1823. 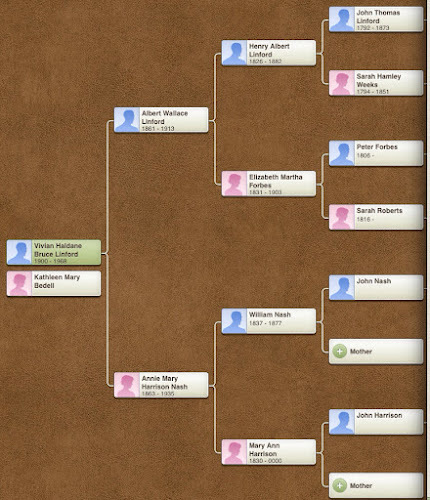 John had been born in Vauxhall, Surrey (now London) to Samuel and Mary Butcher. Samuel was a butcher in Vauxhall and he also owned quite a few properties and had a complex will in 1832. 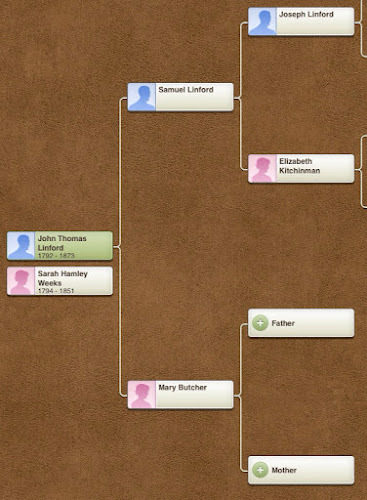 Nothing much is known about his parents Joseph and Elizabeth Kitchinman other than their marriage in 1750 which produced three children.